Okay, in my defense I'm at the beach for the week and I think that you should read some pure fluffy books while sitting at the shore. My friend, Nelson, calls these books "black cover books" and I have to admit that much of the cover is either black or in dark tones. Also, I'm planning a trip out west this spring and this story takes place in Taos, which I'm planning to visit. Call it a peek into the future. That having been said, Sue Henry reminds me of the writing of Oklahoma City writer, Carolyn Hart. They both write very enjoyable cozy mysteries. This is the story of Maxie McNabb, a 63 year old Alaska resident, who buys a "Minnie Winnie" and is touring the lower 48 alone except for the mini-dachshund, Stretch, who is her constant companion. The story begins in a weaving/knitting store in Taos and spins (pun intended) out of control from there. A quick read. The reader can take breaks to watch the dolphins or take a quick dip in the pool without losing the thread of the story. I will, no doubt, read other books in this series. I have not totally warmed up to this series yet. Although I would classify this one as a cozy mystery, it seemed more of a travelogue of Taos, New Mexico and surrounding areas with a murder thrown in as an afterthought. If I had ever been to Taos, this might have been appealing; but for me, this made the book a slow read.The book begins with 63 year-old Maxie McNabb and her cute little mini-dachshund, Stretch, fleeing Taos in her Winnebago RV, because she fears a killer is out to get her. She begins writing in her journal which reveals the back story. Maxi is out touring the lower 48 states and stops in Taos for a few days. While there, she visits a local weaving store called Weaving Southwest. She has bought yarn through the mail from the owner, Pat Dozier, before. Looking at the colorful tapestries hanging in the shop, Maxi gets "the bug". She wants to learn to weave. While in the shop, a gossip runs in and lets Pat know that a friend of hers, Shirley Morgan, has tried to commit suicide. Maxi accompanies Pat to the hospital where Shirley adamantly denies trying to commit suicide, yet doesn't know what really happened. Maxi volunteers to let Shirley spend the night in the Winnebago because her duplex isn't safe. Shirley reveals that she has been duped out of a hundred thousand dollars by a con artist named Anthony Cole. Coming back from a morning walk, Maxi discovers that Shirley has disappeared leaving no clue where she has gone. Later, she is found murdered in her bathtub apparently from a second suicide attempt which succeeded this time. Maxi doesn't think so. Other events include Maxi meeting a somewhat new friend and former truck driver named Butch Stringer who takes her places and helps her out, the Winnebago being ransacked, poor Stretch being dognapped, Maxi helping Officer Herrera in the investigation, a mysterious woman looking a lot like Shirley confronting Maxi, and a dead body of a man found in a wool dying vat after a fire had already been lit under it. After Maxi has left Taos, she discovers that what the killer has been looking for is cleverly hidden in the Winnebago. Feeling guilty about running away, she returns to Taos with the found item, and the killer tries to kill her. I was surprised, because I never guessed who it was. The ending explanation of what was going on was kind of convoluted. Also, for me, it was unsatisfactory; because some things were never "wrapped up". We never found out how or why the man's body was found in the dye vat for instance. It will be awhile before I pick up the 3rd in the series to read. But the travelogue descriptions were vivid, and I could visualize the landscapes, stores, people, etc. - just didn't make for suspenseful reading. The Tooth of Time reads more like a travelogue of New Mexico than a murder mystery. I would say that you are about halfway into the book before the main mystery appears. There is a brief mention of a body in a yarn-dying vat prior to that, but it is quickly brushed over. It is not until the very end of the story, before you are told that the two murders that appear in the book are related.Maxie McNabb and her dog Stretch are once again on the road traveling in their Minnie Winnie and exploring the Southwest. They have stopped in Taos, New Mexico to check out a yarn store and perhaps learn a bit about weaving. After a brief encounter with a fellow shopper, Maxie is surprised when she is asked to visit the same woman in the hospital after an apparent suicide attempt. Being the good-natured woman that she is, Maxie visits and decides to take Shirley home until she can get her feet under herself again. Disappearing the next morning, Shirley leaves a trail questions and swarthy characters in her wake. Taos may not be a large community, but they do seem to have questionable people so when Maxie does not reveal what she may know about her houseguest, her poor frightened pooch is dog-napped until Maxie hands over the goods. Yes, it is that trite. Apparently, you do not come between a senior citizen and her traveling companion, so with the help of her new friends and a very convoluted story of conning and deceit that does not come to a full conclusion, you find yourself suddenly at the end of the book wondering if you missed something. I cannot say that I liked this book; I like my murder mysteries to be more about the bodies and less about the RV and its hiding spaces. Not to mention a satisfactory ending that does not have me scratching my head wondering if either there were pages missing or if Sue Henry got as frustrated with the storyline as I did and decided to put us both out of our misery. I recall enjoying the first book in this series, The Serpents Trail much more than this book. I will continue with this series and hopefully, the next book The Refuge will capture my attention a bit more. An RV (recreational vehicle) adventure with just a bit of mystery and a new hobby/craft. Mainly I borrowed this book for the mystery. Maxie & Stretch stumble into the middle of some weird stuff, while Maxie knows she should stay out of things, she gets involved anyway! A friend of a friend is in the hospital recuperating from a recent attempt at suicide. Maxie's friend is busy and asks her to take care of the new acquaintance, Shirley. Maxie finds out a few things, and realizes that Shirley had no intentions of killing herself and explores what's really going on.Throughout the book, Maxie has some good thoughts, or some good advice for us ladies. She has her view point on how we should age gracefully and to not allow ourselves to fall to the temptation of plastic surgery. She reflects on lessons learned from her two late husbands, especially her most recent husband. Stretch happened to be his dog, and this is why Maxie loves their dog so much. I plan to reread this book with a notepad nearby, so I can quote these little lessons.This year I seem to be on the 'hobby' theme for books. A month ago, paper-crafting, this month, back to yarns & fabrics. In "The Tooth of Time" we are introduced the craft of weaving. There's a few decorative things you can do with weaving, too. Rugs, throws, pillows...and in so many colors & patterns, too. I was very tempted to dig out my little sister's Fisher Price weaving loom!There's travel involved, too. Though I've only been on a few RV travels just my mom and me, I can relate to Maxie who is a woman (plus Stretch) traveling on her own. Like my mom, she knows what she's doing and can set up her RV on her own. Woman Power! In my top 5 fav books. This is book 2. The whole series was great. There are 4 books in the series, and I wish Sue Henry (one of my fav authors) had kept the story going on into more books. This is a cozy with a bit of thrill. I loved that you have an older lady who lives in Alaska but takes her RV, along with her weinee dog Stretch into the lower 48 for travel and adventure. Along the way in each book she visits a different state, a different murder. Or rather murder seems to find her. She is always the smart cookie in aiding cops in who did it. Sue Henry the author writes so well and descriptively yet not over the top, you can vivdly and clearly visualize everything she wants you to see. Ater finishing each book in the series, this is one of those that you know in a few years you would want to read again. This was the beginning of my love of Sue Henry. She has been ill, apparently according to several sources and is no longer writing or rather publishing any books. Her last one was in 2010. She also writes another series set in Alaska about and around the Iditarod Trail and dog sled racing. Those books are fantastic. If you love cozys or mysterys, Sue's books are the place to start. Alaskan senior citizen Maxie McNabb, along with her weiner dog Stretch, have been traveling in the lower 48 states and the current journey takes them to Taos, New Mexico, in their mini Winnebago RV. While visiting the local yarn shop Maxie is mesmerized by the beautiful woven articles on display and soon she is knee deep in locally dyed yarns and her own small weaving loom. What should be a quiet, picturesque visit to a renowned American art colony quickly turns into a murder mystery for Maxie as she becomes an innocent bystander when a new acquaintance is killed after visiting Maxie in her Mini Winnie. Apparently the murder victim hid something valuable in the motor home because Maxie finds it ransacked and her beloved Stretch dognapped. 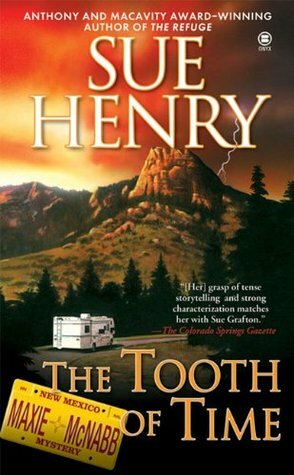 Unable to find whatever it is the killers are after, Maxie fears for Stretch's life as well as her own.This is the first book I have read in this series by Sue Henry and while it was a quick, light read I don't think I enjoyed it enough to continue with the rest of the books. The mystery itself was rather convoluted and strange but Henry's descriptions of New Mexico, Taos and the art of weaving are very interesting. The Tooth of Time: A Maxine and Stretch Mystery (Maxie and Stretch Mystery) Offered by Penguin Publishing Price: $6.99A fun duo but not enough mystery, June 9, 2013 This review is from: The Tooth of Time: A Maxine and Stretch Mystery (Maxie and Stretch Mystery) (Kindle Edition) "The Tooth of Time"Since I have 2 dachsdhunds myself I've enjoyed reading this series. Sorry to say that this book in that series did not hold my interest as the others did.Maxie is a 60ish owner of Stretch, a lovable dachshund. Their interaction was the most enjoyable part(s) to this story. This book has Maxie driving her Winnebago along the southwest area of the USA. While in New Mexico Maxie learns of a woman that has attempted suicide...or has she? What or who could have caused such desperation in this woman?I've enjoyed this series before and usually authors run into a snag of sorts in their writing. And so I will continue with this series but this book was not my favorite. This is the first book I read by Sue Henry. I loved it!I usually skip over the narrative about the rolling hills and crap. But I found myself reading hers. She has a way with words!This about Maxine and her little dog. She's a widow from Alaska. Maxine has her RV and she and her dog spend many months each year on the road just going to where she fancies. She also gets caught up in murder and solves the cases. Really cute and fun to read.I just found that she has written a bunch of books and I have them on my list to read. Can't wait to see if the library has them since they are in paperback.READ!!! Too much fun! I had to read a simple mystery after Natchez Burning so I chose this one about a middle ages widow who travels the country in her Mini Winnie RV. She is now in NM which is near and dear to my heart since our eldest daughter and her family lived there for 10 years, and it was fun to revisit through fiction! The widow is drawn unknowingly into a mystery as she tries to help another woman in distress through her friendship with a weaver. Anyway, it was a perfect "read" after a a complex "read" that I could complete in 2 days before moving on to something deeper! This Sue Henry is not the Alaska novels I've read by her before. Maxie McNabb is twice widowed and traveling in her Winnebago. She has arrived in Taos, New Mexico and goes to a weaving shop. From there she meets a middle-aged woman and then gets involved in a murder; she meets an old friend; she is robbed; her dog gets kidnapped; etc. The writing seems a little stilted and the book has lots of description and is a little slow moving. I didn't think the characters were well-developed, other than Maxie. Disappointing! First thing, Poor Stretch! Maxie shouldn't leave him alone in the car so much or in the RV so much. Once again Sue Henry has written a mystery full of loose ends and characters that do things only for the purpose of fooling the reader. There are things that don't make sense, plot twists that aren't ever explained, and weird foreshadowing that never goes anywhere. I enjoyed all the description of the Southwest, the book made me want to book a trip to the Southwest but it didn't make me want to read another Sue Henry novel. Maxie and Stretch are on the road again in the lower 48 states, the southwest to be specific. This time it started off with the murder of her best friend and continued on to Taos, New Mexico, and Colorado. In Taos, Maxie gets involved with a woman who claims she did not try to kill herself, but evidence seems to indicate she did. Later, she succeeds, or was she murdered? Because of her connection to the woman, Maxie is pulled into the mystery and almost gets killed herself. But as usual, Maxie doesn't give up, even after Stretch is dognapped. I read The Refuge, the third book, before this one and was a little dismayed at several similar plot elements, but the story was light and enjoyable and the travel descriptions interesting--which seem to be the main point of this series anyway. I'm beginning to wonder if she's sponsored by an RV trade association. A sort of a cozy mystery with a retired female protagonist who roams in her Winnebago and gets involvesd in solving local mysteries as she goes. This book is also thematic; the author makes sure to provide you with a lot of information about weaving, Taos, and Alaska. It does get very obvious when she does this. The character is likeable, and her little dachshund provides some comic relief. I don't think that the seris is particularly gripping, but it reminded me of my own mother-in-law. Sue Henry was a new author for me. I really enjoyed her Winnebago driving Maxie McNabb, the Alaskan who is driving around with her companion, Stretch, her little mini-dachshund, and stopping where she wants. This trip takes her to Taos where she is quickly immersed in a dangerous mystery that involves murder and weaving. Somehow the murderer thinks that a woman she briefly befriended has given her something. I will have to find some more of this author. This book is #2 out of a short series of 4. I enjoyed this one the most due to the Taos, New Mexico setting. I resonate to this series for many reasons--primarily since it is a "wish-fulfillment" experience for me. Maxie, the intrepid heroine, is roughly my age (60); she travels with a dog (ditto). But most of all, she gets around in a Winnebago. I love Maxie's down-to-earth personality and fearlessness. She is a good and loyal friend and has a good heart.The series is a treasure! I liked the premise of an older, independent woman traveling around the country and solving crimes. I liked the descriptions of Taos. I didn't like all the foreshadowing, though. It's a murder mystery; I know there will be bad guys and bad stuff happening so don't need to be told ahead of time. I also was distracted by a couple plot points that didn't make sense. While I adored the first book in this series, this installment was a serious letdown. Not only did I lose some of the love I had for the character of Maxie, I found the plot simplistic and ultimately silly. There were significant omissions in the "solution" and a number of unresolved points. I'm disappointed.--On reread: Meh. I believe I read the first one, too, but it was some while ago. What more appropriate book for me, a senior woman wandering around in an RV. My life is considerably more sedate then hers, but then again, I'm not the heroine of a murder mystery. And I don't have her knack for making friends. This one is set in Taos and environs, and I just spent the summer in Albuquerque, so I really enjoyed it. Driving a mini winnebago across the country, Maxi McNabb and her dog, Stretch, end up in New Mexico where she wants to learn how to weave. The story takes place in Taos in a weaving shop I have been to visit several times. She finds herself helping a woman who attempts suicide and gets involved with the people of one of my favorite places in the USA. This has the interesting premise that senior Maxie is traveling around in her Winnebago with her dog Stretch. Unfortunately, the mystery part of the novel is a letdown. The characters aren't that well developed, either. The tone of the narrator of this mystery series, Maxie Mcnabb, is annoying with its conventional insertions of adjectives like "pleasant", "attractive", "comfortable" and much of the book reads like a travel brochure. Yet, Henry's plots are pretty well done and her culprits are a surprise. My first Sue Henry mystery == I loved it. Maxie is a not=young heroine who lives in Alaska, but travels around the country in her Winnebago. And of course, incidents occur wherever she goes! Great fun!!!! Like the review says: She's the Winnebago-driving, pistol-packing sixty-something-year-old-and she's back, with her dog. I enjoyed the lite mystery, the explanation of weaving and view of the Southwest. She's an independent woman and I liked reading about her trials, triumphs and travels. I always enjoy Maxie and Stretch and this book has them in New mexico on a vacation. The title comes from a mountain in the area of Taos, NM. where they of course find themselves embrioled in another mystery. Enjoyable and easy read. Wonderful new series. Maxie McNapp is 63 and travels over the country in her Winnebago with her mini-dachshund, Stretch. In this story, they fall into the middle of a murder mystery in Taos, New Mexico. The perfect vacation read - my mom and I read it while spending a week in New Mexico - it's set in the Taos area. Lovable characters and not-too-suspenseful-yet-still-engaging mystery...like I said, perfect for vacation! A good, cozy type mystery. Like the main characters, Maxine and Stretch her mini dachshund. Set in Taos, New Mexico where my husband and son are soon going hiking in the scout camp, Philmont. They will see the Tooth of Time while they are there. Sue Henry - Sue Henry is the author of six novels in her award-winning Alaska mystery series: Murder on the Iditarod Trail, Termination Dust, Sleeping Lady, Death Takes Passage, Deadfall, and Murder on the Yukon Quest. She has lived in Alaska for almost aquarter of a century, and brings history, Alaskan lore, and the majestic beauty of the vast landscape to her mysteries. Based in Anchorage, where she teaches writing at the University of Alaska, Anchorage, she is currently at work on the next book in this series.